These pages contain information of specific relevance to employers. Please use the menu options on the left to navigate around the pages. There is a lot of guidance available for employers regarding disability and work. Where appropriate we signpost to these other sources of information, many of which are excellent. You'll also find some of the links useful on our web links page. Supported employment is a very personalised approach to matching the right person to the right job. Employers are seen as key customers for supported employment services. After all, without employers there would be no jobs. The aim of our members is to successfully place someone into sustainable work. That involves close working with the jobseeker and the employer. Support should be available for as long as it is needed. The Government has launched the Disability Confident campaign to encourage employers to recruit and retain disabled employees. 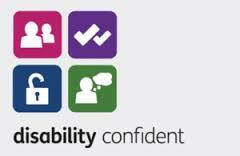 You can view a range of videos on the Disability Confident YouTube channel. There is a strong business case for employing people who might otherwise face exclusion from the workplace. These pages can guide you through the process of employing and supporting workers with a disability. Flexibility is the key. Our advice is to start small and gain confidence as you understand the issues involved. Much of the advice is about implementing good management practices and you'll find that there is generally local support available at no cost to your company. Whilst BASE cannot guarantee the quality of service of each of our members, we would like to know if you feel that a service has not met your expectations.